All the Assembly Songs You'll Ever Need! 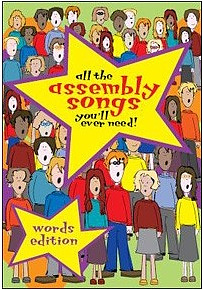 All the Assembly Songs You'll Ever Need is full of popular, traditional hymns and songs that children will love to sing. All the Assembly Songs You'll Ever Need! was published by Kevin Mayhew in December 2006 and is our 25258th best seller. The ISBN for All the Assembly Songs You'll Ever Need! is 9781844176991. Reviews of All the Assembly Songs You'll Ever Need! Be the first to review All the Assembly Songs You'll Ever Need!! Got a question? No problem! Just click here to ask us about All the Assembly Songs You'll Ever Need!. Details for All the Assembly Songs You'll Ever Need!